If you’re seeking a fun, playful look for your blog or website, we have the theme for you! 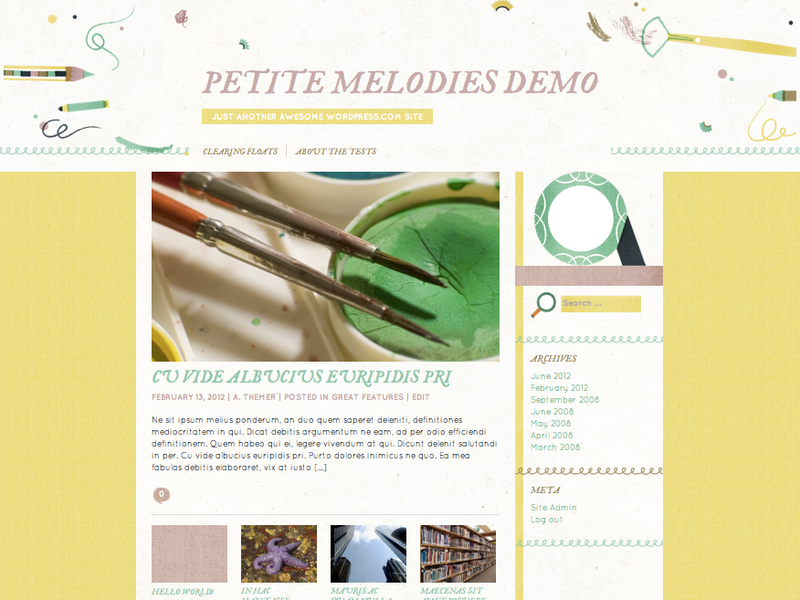 Petite Melodies is a beautiful new premium theme designed by Sol Linero. Choose from three quirky illustrated styles: Want a sweet design for your baby blog? My Petite Melodies is playful and childlike. Or maybe you need a place to showcase your illustration — we’ve got you covered with Pencils and Crayons. Or perhaps you’d like a more modern design? Un Blog should do the trick. In addition to multiple styles, Petite Melodies also includes two ways to display your posts, space for a brief welcome message, and social media icons for Email, Twitter, and Facebook. Add a touch of whimsy to your blog by visiting Petite Melodies on the Theme Showcase! These versions are stunning! Thanks for allowing such a cool theme to be free! Oh, wait. Except it isn’t. Sorry I missed the word “premium” amidst such awesomeness. It has a nice vibe. Like maybe Richie Petrie’s bedroom wall was decorated like this when he was really little. Yup. Funky. Not always a blog should be a SERIOUS looking thing. Good. Will certainly check its features before going ahead with one of other blogs that I am planning to be a funky material. Thanks for the work and the share here. Nice! Tempting me to try a premium theme for my blog!!! We love this one! Chulísimo! Woooow I really love this one… so delicate!!! Great stuff, Caroline… you are making the world a better place. I love the subtle colors and the playfulness. The theme is packed with useful features too including the “Showcase” style, featured images, etc. I’ll be playing with it on my test blog to see if it will be a good choice for my personal blog. Yikes! I just read over the word “premium”. 😦 I assumed it was a free theme. Beautiful theme. I like it. Never any free themes that are really nice. Ick. We’re always adding new free themes! Hopefully you’ll find something that appeals soon. 🙂 In the meantime, if you find a free theme you love that isn’t available on WordPress.com yet, you can follow the instructions here to suggest it! LOVE this! Right, nice, funky and ALIVE! for what I do working with children and families for our literacy campaign. G’wan gurl! I think this is the first childhood-like theme on WP. The team is very creative. The header looks very impressive..
What a beauty. I have been looking for this… can’t wait to start using it… a stunner and one of the best themes. Wow!! So sweet!! Very Beautiful and Cute!!! This is a very fun theme. It would be well worth paying $60 if I didn’t know that next month an even better theme for my blog might come along. I have the CSS upgrade, however, so there is no reason I can’t use some of the design ideas from any premium theme and incorporate them into the theme I am currently using! This is gorgeous. I love the font, the linen-textured background… any chance it can be set up to preview my blog with one of the two other designs? You can do this by going to Appearance -> Themes and clicking on Live Preview under the Petite Melodies theme. Once in the Customizer, you should see a tab on the left called Theme Options where you can select and preview the other two styles. You can read more about the Customizer here! Will be passing this one up; nice, but doesn’t suit my blog style. But it should be “petites” as a plural or “petite melodie” as a singular, otherwise it looks odd. In English there is no plural for an adjective, but it would look odd to you if I wrote “many book on the table” or “few mistake here”. Very pretty, I like it so much. I love this theme; it’s very cute. I love that theme!!! Well, I want to buy it for my self-hosted WordPress blog. Is it a WordPress.com exclusive or do we have the chance to buy it for self-hosted blogs too? We’re so glad you like it! This theme is exclusive to WordPress.com and not currently available to self-hosted WordPress blogs. Blog is one of my most favourite ones ever! I may sound fake since a lot of people go on and write these post even if they don’t mean it, but seriously, I really admire. Really nice theme, but just for personal use, not for business. Wow man, this is a really awesome theme. These are fantastic! I love the variations. Very adorable. Great for a particularly-themed blog – there should always be options for different things. My favorite aspect is the sidebar, I must say. Not my favourite, but good design! Ah… how nice it is! I love it! I should give it a try. I really like this theme, but exactly HOW do you get it??? You can find it by going to your Dashboard under Appearance -> Themes, or you can visit the Theme Showcase–there’s a handy “Buy & Activate” button there! Thanks so much Caroline! The theme is GREAT. 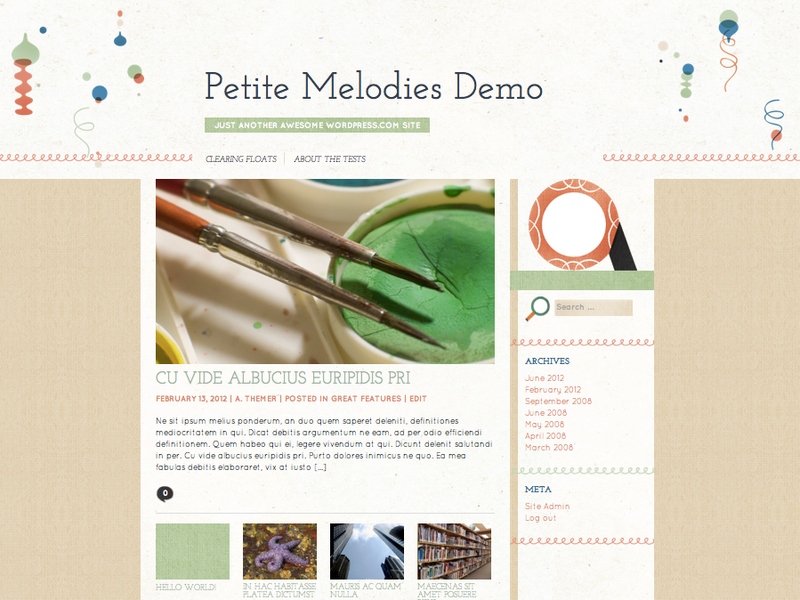 Petite Melodies is a premium theme, but we’re always adding new free themes, too! It’s OK, not the best though. So coooollll… I so love it! What a beautiful little thing! The preview on my blog makes the poetry look so nice, I might try it! Very cute theme. Well designed and refreshing. If I may say something, in French we write the adjective in in the plural. It should be “Petites Melodies” but perhaps it’s not written in French? Too cute… I’d use it if I were a teenage girl. Nothing against it, though. Its target audience will love it.